Well, I have finally found a great use for my old magazines that I never know what in the world to do with. We have been working on numbers (reading and writing them--we're up to 8 already!) and letters/phonics, as well as many other concepts and ideas. 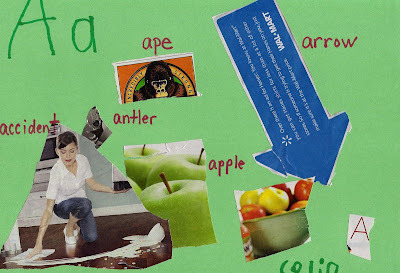 Colin's project this morning in our "learning time" was to look through a magazine for things that begin with the letter "A"; cut those items out; and then glue(stick) them onto construction paper. Keep watch for the presentation of the letter "B"--coming soon to a blog near you! I'll have to think of a couple of "B" words for next time. Good Job Colin!!!!!! AWESOME!!! !Can't wait to see you. That is great to have him doing things like that. I have started doing "school time" with Reese too. It's fun and it gives a mommy a boost of confidence when they actually get something. hey now. I don't think I was done with those magazines! aw man! hopefully he didn't cut out the part of that easy Apple butter. Way to go Colin! I am way impressed you have the patience to teach him...I don't! That is a big reason we sent Caden to preschool, plus the fact that I have a 20 month old and a newborn at home! Oh Devin this is great! You're going to regret showing me this because now I will bend your ear about preschool! I have no idea what I am doing but I'm enjoying it!